Ever since FX abruptly cancelled the highly-anticipated Deadpool animated series coming from Atlanta creator Donald Glover and his brother Stephen Glover, we've been hearing more about the series than when it was in development, and now we finally have our first "look" at the show. Earlier this week, Donald Glover posted a mock script for the season finale that addressed racism within the TV industry and fired some shots at Marvel, while his brother Stephen Glover confirmed parts of the highly meta script, revealing they did actually have a Taylor Swift episode he described as "hilarious." While the show will likely never see the light of day, barring a miracle, we can at least see what the show would have looked like, thanks to an animation test that was just released by Titmouse Animation, who had this to say about the video on Twitter. "We heard Deadpool suffered a brutal and premature demise, but we all know he's not really dead. Take a peek at our animation test, it's aight #donaldglover #ryanreynolds @donaldglover #brunch"
The animation test is just over one minute long, and uses Ryan Reynolds dialogue from the 2016 Deadpool movie that the animators worked around. The video shows the Merc With the Mouth hanging out on a beam above a warehouse, where he notices some "bad guys to kill" through his binoculars. It doesn't take long for the Merc to spring into action, with the test using Reynolds' now-iconic "12 bullets" line from the movie along with another line where Reynolds says, "I never say this, but don't swallow," which is paired with a scene where Deadpool puts a bomb into an assailant's mouth. The scene ends in a most hilarious fashion, where the Merc With the Mouth has one of his arms chopped off by a huge, villainous gorilla, leading to the Merc throwing one of his swords into the gorilla's chest, which he then kicks, sending the gorilla into the blades of a helicopter, decapitating him in a most gruesome fashion.The animation test was directed by Barry J. Kelly, who has worked on The Venture Brothers, Son of Zorn, Moonbeam City and others, and it was dated March 17, 2017, just a few months before the animated series was officially announced in May 2017. Titmouse has made a name for itself in the animation world for creating the unique visual style in shows like Metalocalypse, Black Dynamite, Venture Brothers, Big Mouth and much more, although it isn't known for sure whether or not they would have been animating this FX series. was canceled before it even started, there is no indication if this test would accurately reflect how the show would actually look, but that doesn't make it any less entertaining. 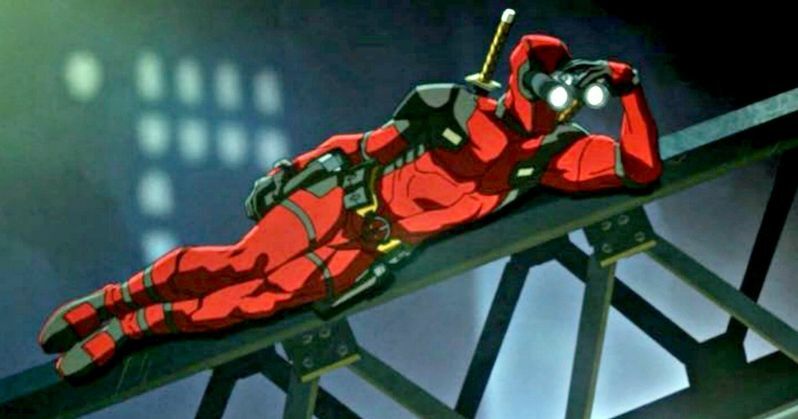 What's ironic is the Deadpool movie was finally put into production after the now-legendary test footage "leaked" onto the internet and was widely beloved by the fans, which lead to the movie becoming an unconventional blockbuster and the highest-grossing R-rated movie of all time at the worldwide box office. Perhaps the release of this animation test, courtesy of the Titmouse Animation Twitter page, and the release of Donald Glover's now-deleted mock script, could generate enough interest resulting in FX un-cancelling the show. Take a look at this animation test below, which has been deleted from the official Titmouse page as of now, for the Deadpool animated series.